Lately my listening activities have focused on two-way FM radio. 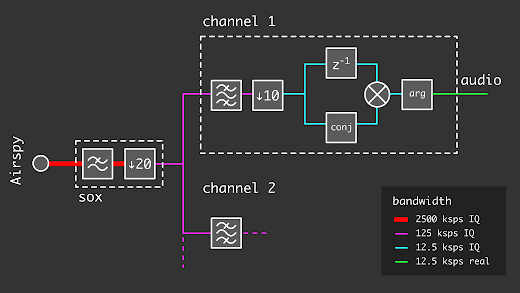 I'm interested in automatic monitoring and visualization of multiple channels simultaneously, and classifying transmitters. 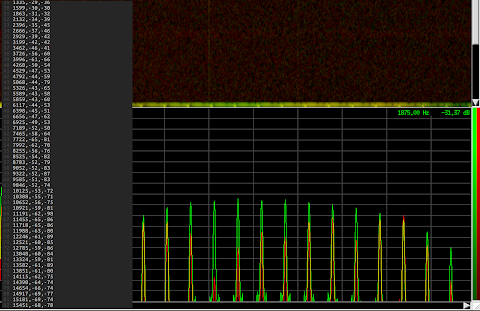 There's a lot of in-band signaling to be decoded! This post shall demonstrate this diversity and also explain how my listening station works. The frequency band I've recently been listening to the most is called PMR446. It's a European band of radio frequencies for short-distance UHF walkie-talkies. 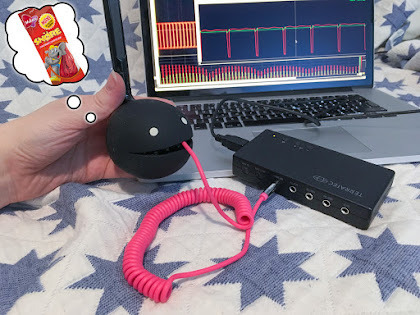 Unlike ham radio, it doesn't require licenses or technical competence – anyone with 50€ to spare can get a pair of walkie-talkies at the department store. It's very similar to FRS in the US. It's quite popular where I live. 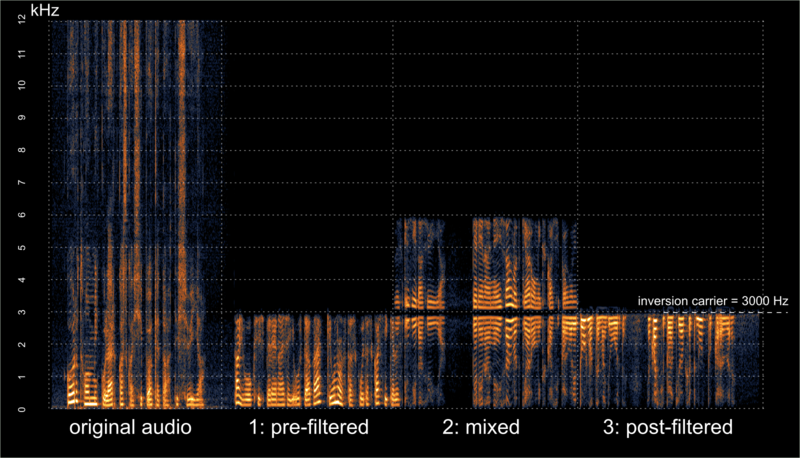 The short-distance nature of PMR446 is what I find perhaps most fascinating: in normal conditions, everything you hear has been transmitted from a 2-kilometer (1.3-mile) radius. Transmitter power is limited to 500 mW and directional antennas are not allowed on the transmitter side. But I have a receive-only system and a my only directional antenna is for 450 MHz, which is how I originally found these channels. 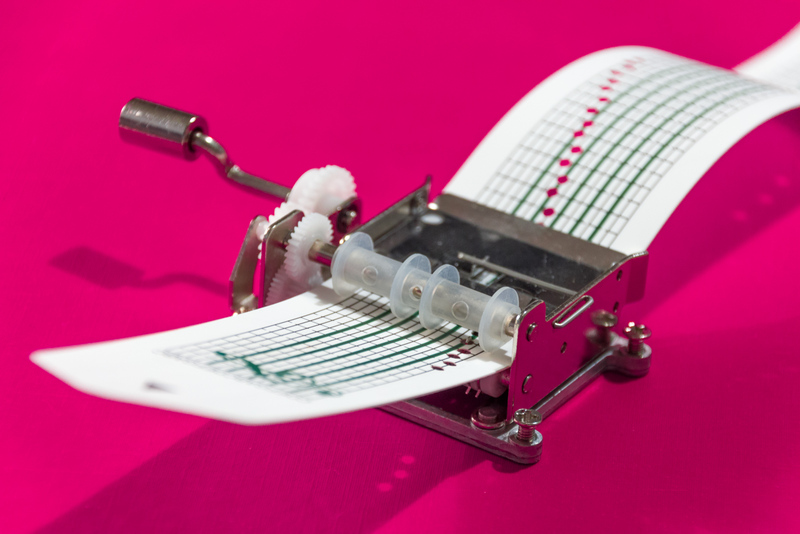 The roger beep is a short melody sent by many hand-held radios to indicate the end of transmission. The end of transmission must be indicated, because two-way radio is 'half-duplex', which means only one person can transmit at a time. 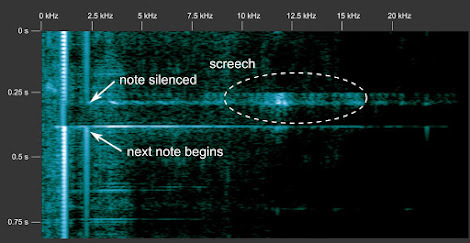 Some voice protocols solve the same problem by mandating the use of a specific word like 'over'; others rely on the short burst of static (squelch tail) that can be heard right after the carrier is lost. 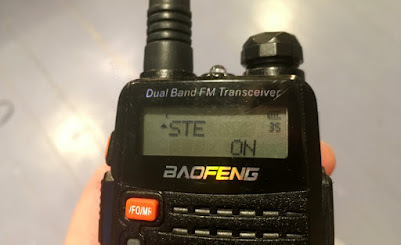 Roger beeps are especially common in consumer radios, but I've heard them in ham QSOs as well, especially if repeaters are involved. 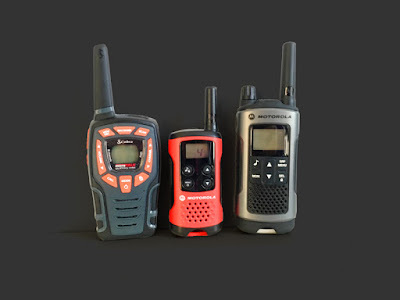 PMR also differs from ham radio in that many of its users don't want to hear random people talking on the same frequency; indeed, many devices employ tones or digital codes designed to silence unwanted conversations, called CTCSS, DCS, or coded squelch. They are very low-frequency tones that can't usually be heard at all because of filtering. These won't prevent others from listening to you though; anyone can just disable coded squelch on their device and hear everyone else on the channel. Some radios have a button called 'alarm' that sends a long, repeating melody resembling a 90s mobile phone ring tone. These melodies also vary from one radio to the other. The computer is a headless Raspberry Pi with only SSH connectivity; that's why it's in text mode. 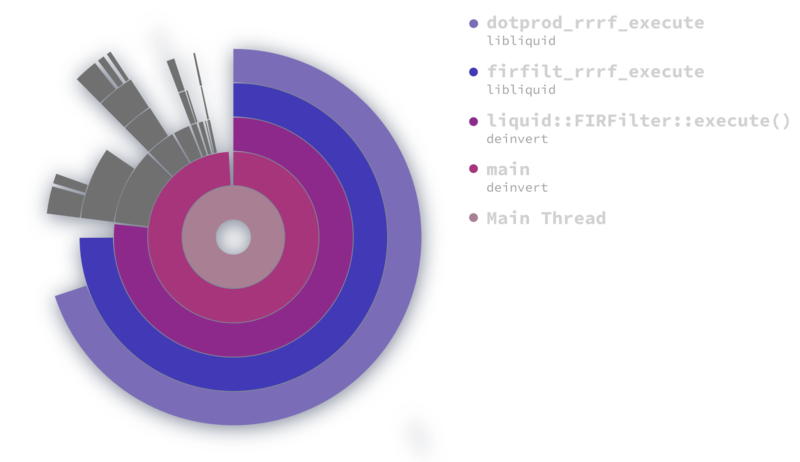 Also, text-mode waterfall plots are cool! The coloured bars indicate signal strength (colour) and the duty factor (pattern). The numbers around the bars are decoded squelch codes, STEs and roger beeps. Uncertain detections are greyed out. 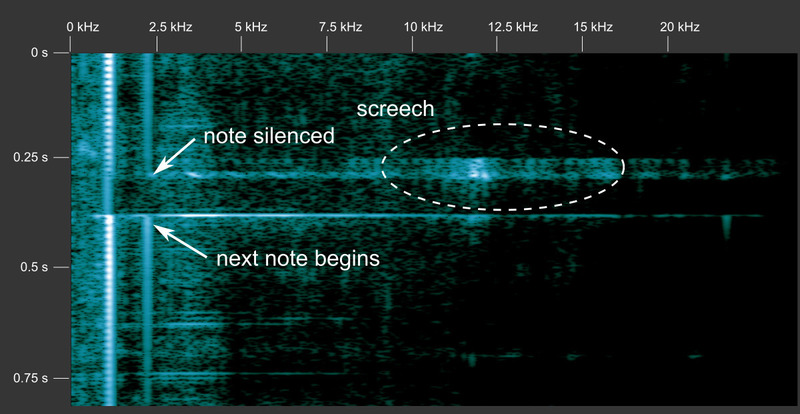 In this view we've detected roger beeps of type 'a1' and 'a2'; a somewhat rare 62 Hz STE tone; and a ring tone, or alarm (RNG). Because squelch codes are designed to be read by electronic circuits and their frequencies and codewords are specified exactly, writing a digital decoder for them was somewhat straightforward. Roger beeps and ring tones, on the other hand, are only meant for the human listener and detecting them amongst the noise took a bit more trial-and-error. The audio buffer is divided up into overlapping 60-millisecond Hann-windowed slices. Every slice is Fourier transformed and all peak frequencies (local maxima) are found. 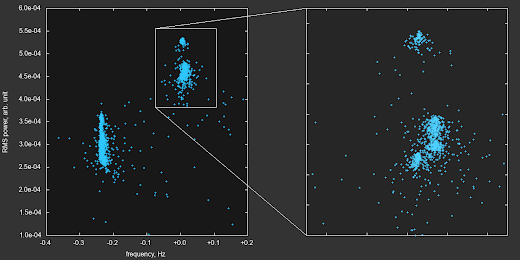 Their center frequencies are refined using Gaussian peak interpolation (Gasior & Gonzalez 2004). We need this, because we're only going to allow ±15 Hz of frequency error. The time series formed by the strongest maxima is compared to a list of pre-defined 'tone signatures'. Each candidate tone signature gets a score based on how many FFT slices match (+) corresponding slices of the tone signature. 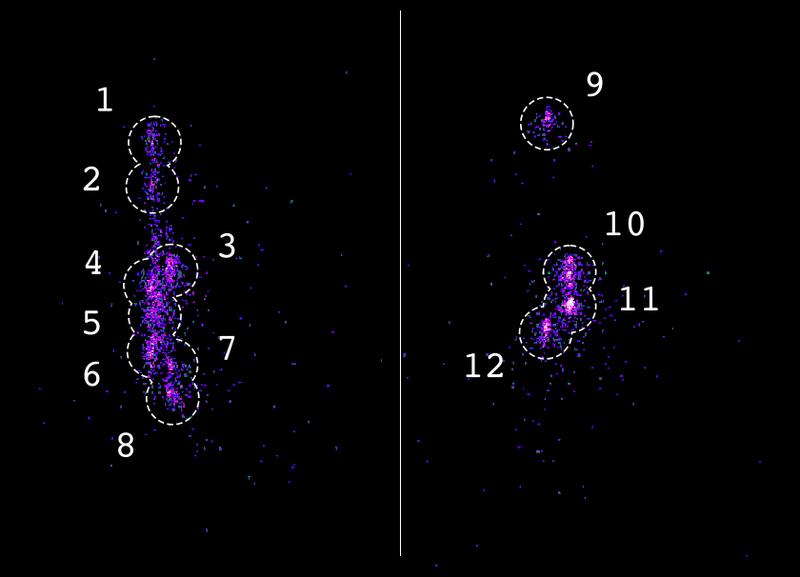 Slices with too much frequency error subtract from the score (–). Most tone signatures have one or more 'quiet zones', the quietness of which further contributes to the score. This is usually placed after the tone, but some tones may also have a pause in the middle. 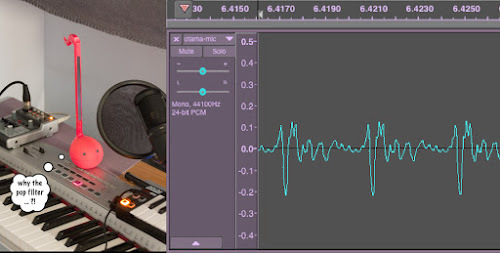 The algorithm allows second and third harmonics (with half the score), because some transmitters may distort the tones enough for these to momentarily overpower the fundamental frequency. 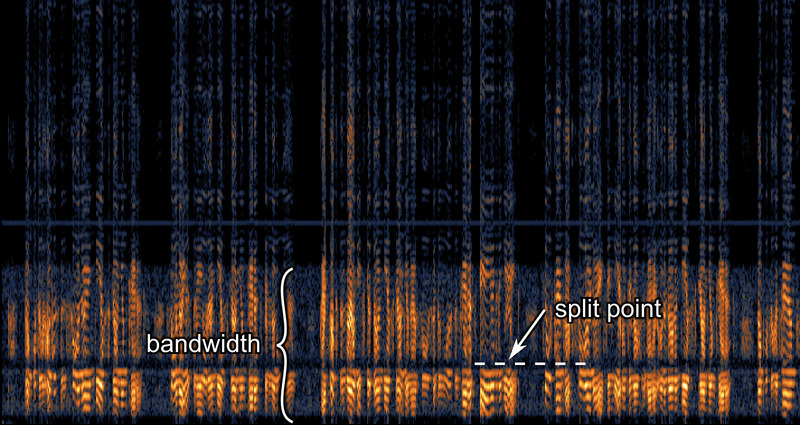 Every possible time shift (starting position) inside the 1.5-second audio buffer is searched. 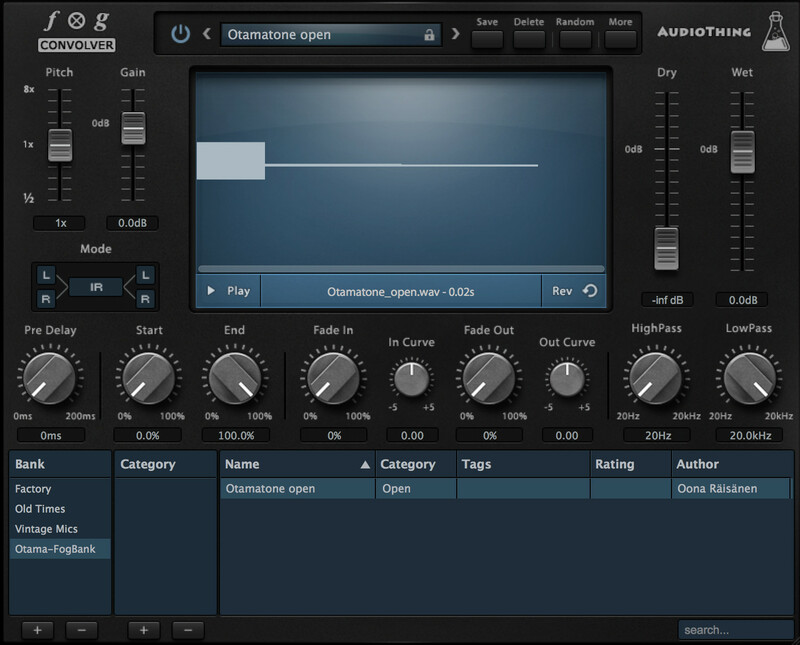 The tone signature with the best score is returned, if this score exceeds a set threshold. This algorithm works quite well. 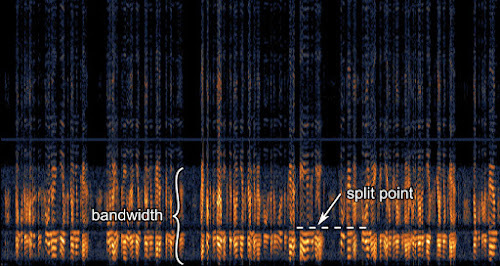 It's not always able to detect the tones, especially if part of the melody is completely lost in noise, but it's good enough to be used for waterfall annotation. 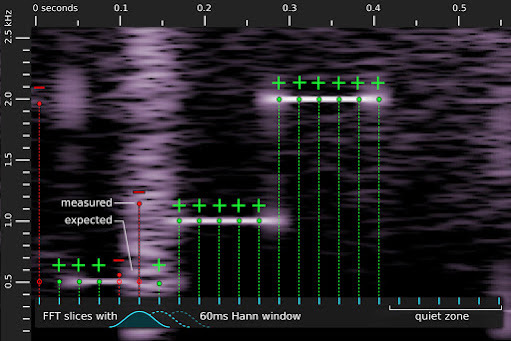 False positives are rare; most of them are detections of very short tone signatures that only consist of one or two beeps. 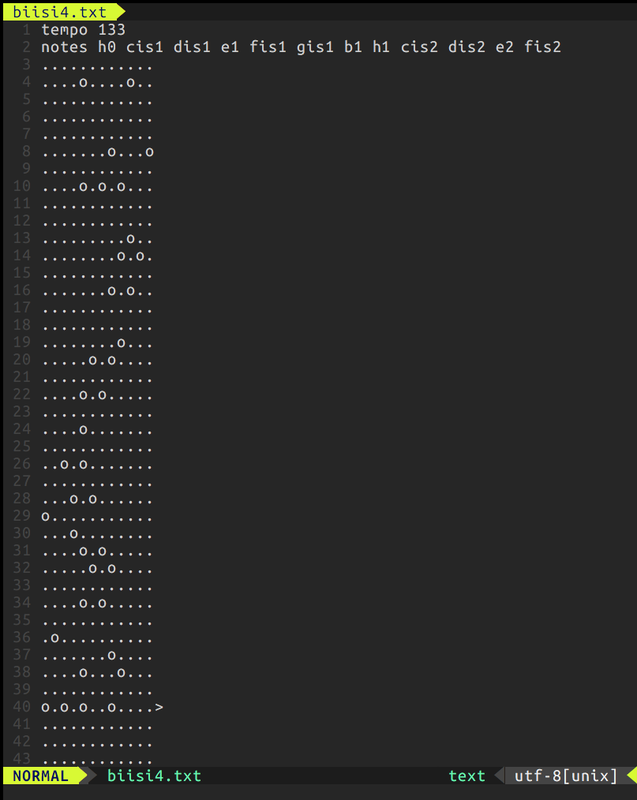 My test dataset of 92 recorded transmissions yields only 5 false negatives and no false positives. Because I love classifying stuff I've had to come up with a system for naming these roger tones as well. My current system uses a lower-case letter for classifying the tone into a category, followed by a number that differentiates similar but slightly different tones. This is a work in progress, because every now and then a new kind of tone appears. My goal would be to map the melodies to specific manufacturers. I've only managed to map a few. Can you recognise any of these devices? This is quite fast. But the 1:20 decimation from the Airspy IQ data is done with SoX's 1024-point FIR filter and could possibly be done with fewer coefficients. 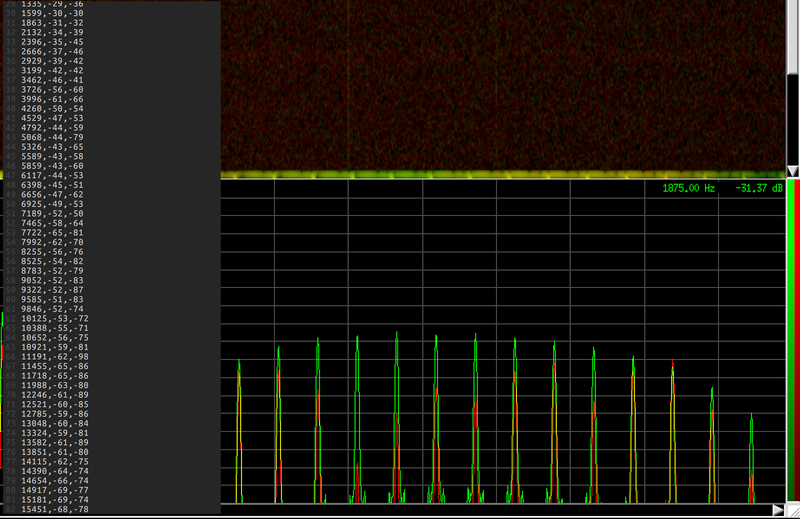 Also, the RasPi has four cores, so half of the channels could be demodulated in a second thread. Currently all concurrency is thanks to SoX and pmrsquash being different processes. Gasior, M., Gonzalez, J.L. (2004): Improving FFT frequency measurement resolution by parabolic and Gaussian interpolation. "I am the atomic powered robot. Please give my best wishes to everybody!" Those are the words uttered by Tommy, a childhood toy robot of mine. 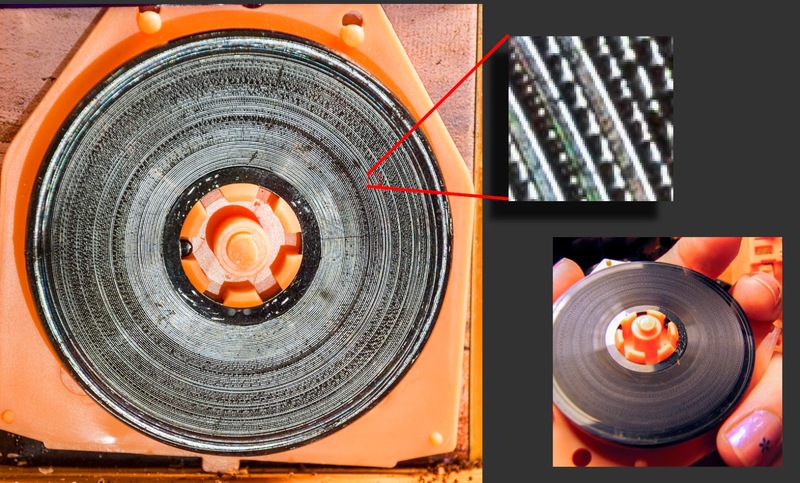 I've taken a look at his miniature vinyl record sound mechanism a few times before (#1, #2), in an attempt to recover the analog audio signal using only a digital camera. 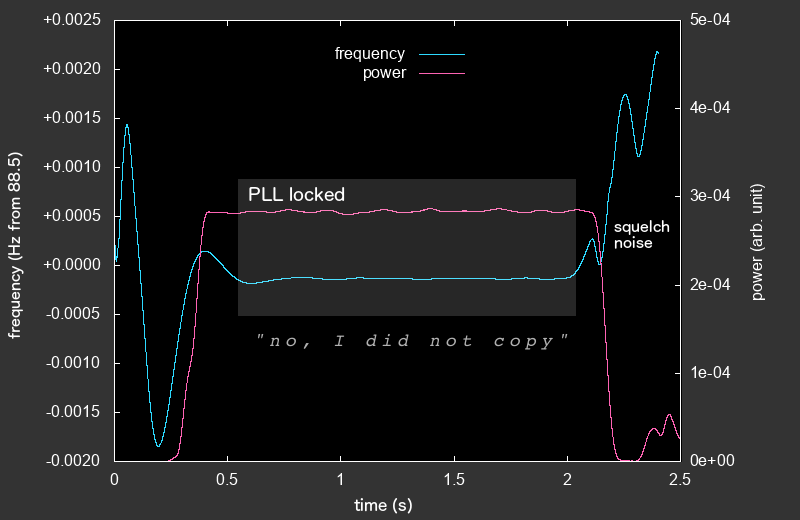 Results were noisy at best. 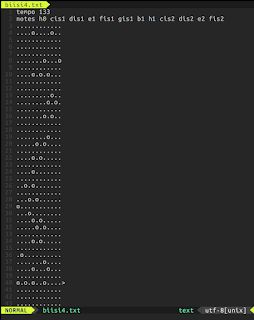 The blog posts resurfaced in a recent IRC discussion which inspired me to try my luck with a slightly improved method. I'm using a photo of Tommy's internal miniature record I already had from previous adventures. This way, Tommy is spared from another invasive operation, though it also means I don't have control over the photographing environment. 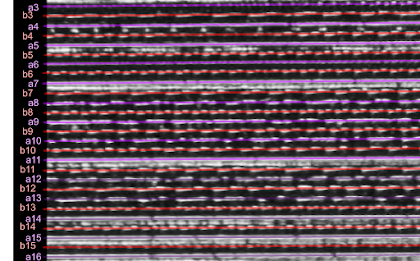 The picture was taken with a DSLR and it's an uncompressed 8-bit color photo measuring 3000 by 3000 pixels. There's a fair amount of focus blur, chromatic aberration and similar distortions. 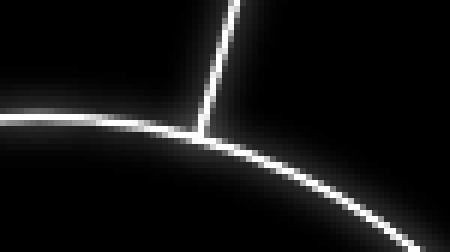 But at this resolution, a clear pattern can be seen when zooming into the grooves. 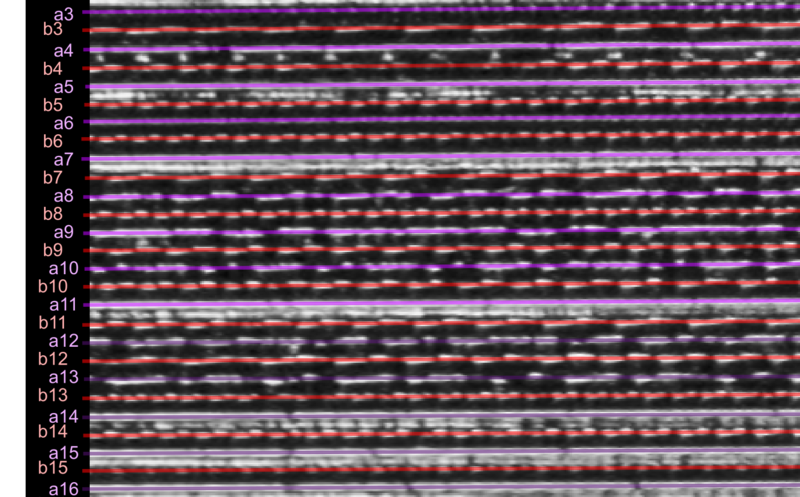 This pattern superficially resembles a variable-area optical audio track seen in old film prints, and that's why I previously tried to decode it as such. But it didn't produce satisfactory results, and there is no physical reason it even should. In fact, I'm not even sure as to which physical parameter the audio is encoded in – does the needle move vertically or horizontally? How would this feature manifest itself in the photograph? Do the bright blobs represent crests in the groove, or just areas that happen to be oriented the right way in this particular lighting? It's not easy to automatically follow the groove. As one would imagine, it's not a mathematically perfect spiral. Sometimes the groove disappears into darkness, or blurs into the adjacent track. But it wasn't overly tedious to draw a guiding path manually. Most of the work was just copy-pasting from a previous groove and making small adjustments. 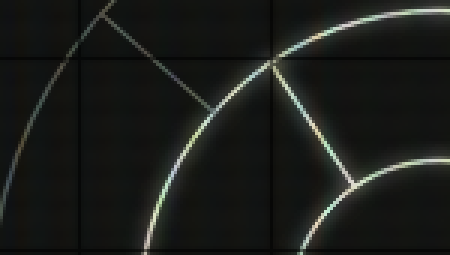 I opened the unwrapped image in Inkscape and drew a colored polyline over all obvious grooves. I tried to make sure a polyline at the left image border would neatly continue where the previous one ended on the right side. The grooves were alternatively labeled as 'a' and 'b', since I knew this record had two different sound effects on interleaved tracks. 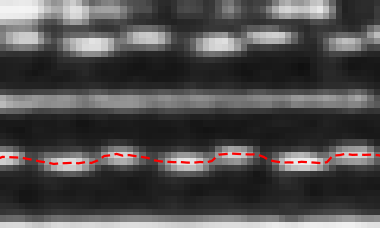 This polyline was then exported from Inkscape and loaded by a script that extracted a 3-7 pixel high column from the unwrapped original, centered around the groove, for further processing. I had noticed another information-carrying feature besides just the transverse area of the groove: its displacement from center. The white blobs sometimes appear below or above the imaginary center line. 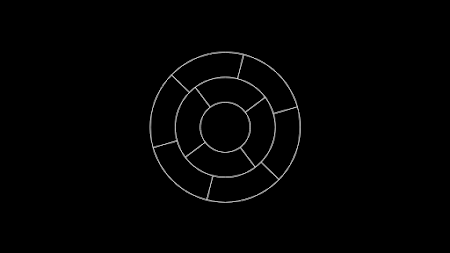 I had my script calculate the brightness mass center (weighted y average) relative to the track polyline at all x positions along the groove. This position was then directly used as a PCM sample value, and the whole groove was written to a WAV file. 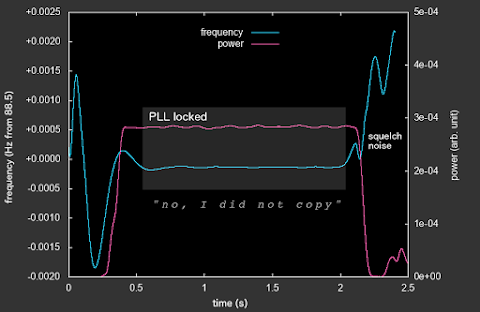 A noise reduction algorithm was also applied, based on sample noise from the silent end of the groove. Several factors limit the fidelity and dynamic range obtained by this method. 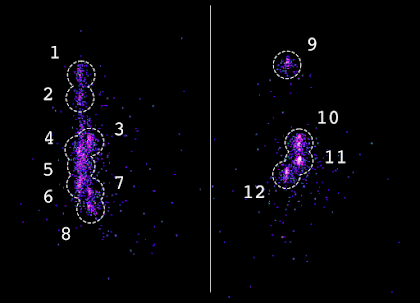 For one, the relationship between the white blobs and needle movement is not known. The results could possibly still benefit from more pixel resolution and color bit depth. The blob central displacement (insofar as it is the most useful feature) could also be more accurately obtained using a Gaussian fit or similar algorithm. The groove guide could be drawn more carefully, as some track slips can be heard in the recovered audio. Opening up the robot for another photograph would be risky, since I already broke a plastic tab before. But other ways to optically capture the signal would be using a USB microscope or a flatbed scanner. These methods would still be only slightly more complicated that just using a microphone! The linear light source of the scanner would possibly cause problems with the circular groove. I would imagine the problem of the disappearing grooves would still be there, unless some sort of carefully controlled lighting was used.